Properties of fura-2–loaded platelets in vitro and in vivo. (A) P-selectin expression, determined by FACS analysis, on unstimulated or thrombin-activated mouse platelets containing fura-2/AM. 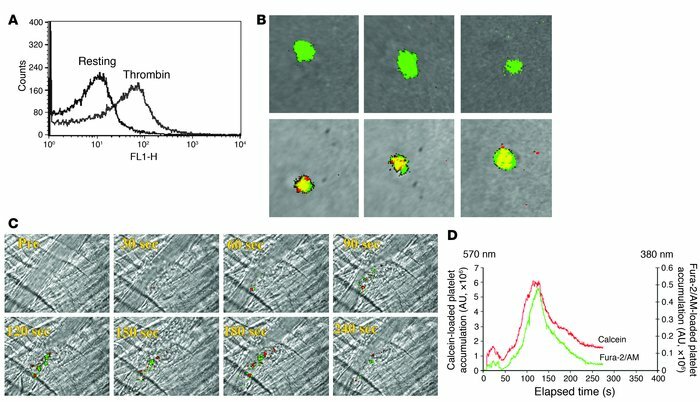 (B) Calcium mobilization in unstimulated (top row) or thrombin-activated fura-2–loaded mouse platelets (bottom row) was determined by fluorescence microscopy in vitro. Emission at 510 nm after excitation at 380 nm is represented in green, whereas emission at 510 nm after excitation at 340 nm is represented in red. Merge is presented in yellow. (C) Platelets loaded with red-orange calcein AM or with fura-2/AM were injected into the circulation of a mouse, and vessel wall injury induced. Images of thrombus formation indicate platelets containing calcein (red) and platelets containing fura-2/AM (green). (D) The median integrated fluorescence intensity of red-orange calcein–labeled platelets or fura-2–labeled platelets in 18 thrombi from 3 mice is plotted as a function of time.